Martin Etzrodt's take on the need of distributed organisations in collaborative research. The Web was created as a coordination and cooperation tool for scientists. Subsequently, it had a revolutionary impact on almost all aspects of our life. The rise of a “network society” did in the end, however, only had a minor effect on the forms of organising among the scientific community. Its paradigm of scientific communication and cooperation between a scholar and a publisher dates back to the early 17th century. This essay is based on a lecture (Etzrodt, 2019a) held during the “Future of Science” session of the Marie Curie Alumni Association’s annual conference at the University of Vienna in February 2019. It highlights the historical roots of today’s challenges in science in scholarly communication, and how open access movements have begun to address this problem. It also proposes how distributed Web technologies (such as IPFS and Ethereum) are poised to enable an entirely new way of communication and cooperation among scientist and citizens. This may lead to the long-sought cultural change within the scientific community, which may finally furnish us with the tools required to tackle the world’s most pressing challenges. The Web for Scientists? – Does not yet exist! In his initial proposal Tim Berners-Lee envisaged the Web as a tool to enable improved communication through “computer conferencing”. At CERN, the world’s largest particle physics laboratory near Geneva, Switzerland, the “Information Management system based on a distributed hypertext system” was intended to help improve the coordination and operation of the site’s complex research projects. The Web like the Internet was rapidly adopted by academia. It is “a medium for collaboration and interaction between individuals and their computers without regard for geographic location” (Leiner et al., 1997), but it has not yet unfolded its true potential for science to become “a pool of information to develop which could grow and evolve” that Tim Berners-Lee proposed (Berners-Lee, 1990). For science this shortfall is rooted in the strong interdependency between scholars, publishers and funders. More generally, the Web lacks ways that permit individuals to ‘own’ a strong, ‘self-sovereign’ identity. Consequently we continue to rely on third parties for attribution (of scientific work), and the ability for the transfer of value (banks and – for science – public funding agencies). The network effects along with massive cost reduction the Web created have today made third parties, such as publishers even stronger. The latin inscription “non solus” of the dutch publisher Elsevier introduced in the 16th century remains even more true today: The need for scientists to be accountable to funding agencies, especially since the 1970s, which led to the introduction of performance metrics for scientific output, has created a complex dependency among scholars, publishers and the public institutions that are funding most of the research, which has been recently outlined by Melinda Baldwin, 2018. Today this leads to a gridlock: It hinders the cooperation of scientists and limits scaling the number of participants in research projects. The requirement in many fields to be the “first author” of at least a few studies does not allow larger, collaborative teams to evolve. Today the increasingly complex problems we face would clearly call for advanced technologies to allow coordination and scaling of scientific organising. 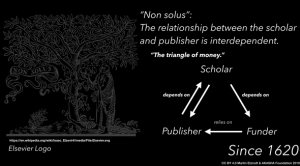 The triangle of money – and dependencies in science. 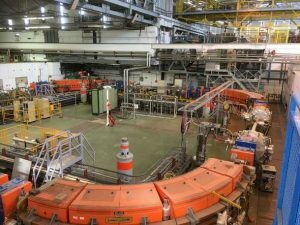 The former Low Energy Antiproton Ring at CERN. Experimental Physics is one of the fields in science that has a long tradition of collective collaborative scientific activities. Putting the negative connotation of a military-scientific complex aside, it is especially unfortunate and surprising that we do not yet find massive, globally acting consortia that for instance aim to approach the search for cures of cancer in an open and collaborative way. Especially given the great and since decades increasing amounts of funding in this area. For instance, here is not a single accepted reliable resource existing for cutting edge updates of research on specific types of cancer. Even if divergent in approaches and opinions, I believe such common resources could and should have already emerged on the Web. Instead we find that scientific fields remain “united in fragmentation” organising their research efforts in mostly independent, small scale teams that risk to reinvent the wheel for the lack of an efficient and state-of the art means of coordination. In countless university hospitals around the world comparably small laboratories are tackling almost the same challenging problems but can share results only with delay and may sometimes even feel tempted to keep essential details on a method secret for exploitation on patents or to publish yet another paper. I argue that this is both an organisational as well as cultural phenomenon. Historically there has been a desire to be “first to discover”. On the latter, for instance Thomas Kuhn describes nicely in his seminal work on The structure of scientific Revolutions how Antoine Lavoisier sent a sealed note reporting his discovery of oxygen to the French Academy of Sciences, earning him time to work on a more detailed elaboration of his finding. It is certainly desirable to be able – when the need arises – to trace a discovery back to the individual who made it. Unfortunately scientific journals have exacerbated the requirement for secrecy and delaying a full disclosure of a new finding because they demand publication of “original work”. “Novelty” is then synonymous for “high impact” and this impact is the metric funders take to justify their fund allocation. A misunderstood concept of “intellectual property” and the need to “patent”, counterintuitively not seldomly incentivised by also publicly funded academic institutions leads scientist to engage in lengthy patenting processes. Finally all this has an impact on the nature of scholars get are selected at our institutions today: Those prevail who are “loud and first” not those who may be “diligent and right”. Remarkable examples on the other hand are the emergence of research institutes such as the Allen Institutes. Here “team-science” is celebrated, and collaborative teams are tackling specific, well defined problems in interdisciplinary teams. Even though it is undoubtedly important to permit scientist to independently choose their area of research and allow also solitary and independent work, I believe team-science will rapidly outpace many traditional laboratory setups that remain to operate in a haphazard fashion on hierarchical and feudalistic organisational paradigms. In the future, forms of decentralised science will emerge (Etzrodt, 2018). Decentrally operating organizations, as described below, will make it possible to attract a much larger number of minds to contribute to a specific scientific challenge so that each individual can work on a problem for which they are best suited, no matter where they are on the planet. The blame for the current situation does not lie solely with the publishers, it also lies within the trained nature of the scientists operational and cultural norms. I am a strong advocate for a cultural as much as for a technological revolution. Cryptonetworking technologies, as I will highlight in the next part, can do things the Web has been unable to do for us to date, allowing to move beyond the traditional paper and also enabling new ways of attribution and thus collaboration and funding of science. Scientific data and knowledge are “anti-rival goods”, thus according to the definition of Lawrence Lessing and Steven Weber the “free dissemination increases their value and exceeds the profit gained by few through copyright or IP”. Today, artificial limitations often transform the scientific result into competing products. Publishers do so in three ways: By restricting the amount of space granted for publication, by charging publishing fees, and, in many cases, still too high access fees. This excludes a large number of people from contributing and benefiting from the body of scientific knowledge. When scientists search for a solution to a long-standing question, shouldn’t they be able to communicate their most recent breakthroughs in a direct and rapid fashion? Shouldn’t they be able to approach fellow scientists or be perhaps pointed to a matching collaboration partner that already found a solution that could advance his or her own efforts? I would argue, that for several pressing challenges it is an ethical necessity to share information and cooperate as effectively as possible. The science theorist and physician Ludwig Fleck described in his seminal work of 1935 “Entstehung und Entwicklung einer wissenschaftlichen Tatsache” (Genesis and development of a scientific fact) that scientific research is collective work, not a formal construct, but strongly dependent on the context within scientific communities. Such “thought collectives” change scientific ideas over time. Scientists need to be in constant communication, which was highlighted by Michael Polanyi (1962) in his essay “The Republic of Science” where he states that “Activities of scientists are coordinated and rely on constant communication. Adjustment […] occurs in response to the results obtained by others“. Today we define the ability of a group of people to extend their individual capabilities through cooperation and to reach a consensus on a certain task that can be more complex than the sum of the individual’s contributions as collective intelligence. The Web has greatly facilitated and vastly accelerated the emergence of collective intelligence. It permits effective “ad hoc” communication through computer networks in real time and at a global scale and at minimal cost. Manuel Castells points out that “new information technologies are not simply tools to be applied, but processes to be developed” (Castells, 2000). 30 years after the Web’s creation we face both a crisis in the “social” Web as much as we do in the “Web for science”. To evolve towards the “pool of information to develop which could grow and evolve”, as proposed by Tim Berners-Lee, we need to introduce the technological improvements the distributed Web offers. This will include the ability of creating decentralized identifiers (DID) and to prove ownership of a scientific contribution through cryptographic signatures. The recent advent of blockchain technology has solved first the double-spending problem, bitcoin’s fundamental achievement. Now cryptocurrencies enable direct, peer-to-peer transactions. Notably, such “value” does not need to be monetary or “fungible” value. It’s not just banks as intermediaries that are threatened. This same technology allows us to “own” a cryptographically provable “address”, a form of proto-identity of ourselves on the Web that let us claim ownership and create transactions – also transactions of “knowledge”. This is the birth of an autocratic and collective publication medium. In his work on the Economy of Insight, the cyberneticist Paul Pangaro (2011) has formulated – “Conversations as Transactions” (2011), meaning “wealth creation has shifted from prior knowledge to the ability to gain knowledge-in-action”. Distributed ledger technologies (DLTs) and peer-to-peer file storage networks such as IPFS now enable us to create an immediate permanent publication of any of our results and ensure direct attribution of the work. The stored data, timestamps and ID information is largely interoperable on the distributed Web, and we can create binding agreements that will execute as enforced in “smart contracts”, given previously defined conditions are met. This is largely reducing the administrative overhead and the need for institutional intermediaries. For example, it may be possible to create “peer-to-peer” fund allocations among individual scientist. We could for instance release a grant payment according to previously defined conditions or incentivise the creation of a prototype for which, following the proof of functional implementation, funds are released. DLTs are the missing link that many previous proposals for scientific publishing on the Web lack (for instance Wasserman,2012 and Noll, 2009). This approach is also very well compatible with preprint servers and even extends the use of them. In 2017, Dr. Sebastian Bürgel and myself performed a proof of concept experiment in which we used some scientific microscopic data I obtained and analysed for my research at the Biosystems Science and Engineering Department of ETH Zurich. We broadcasted them on the Interplanetary File System (IPFS), while we stored the hashes of this work through an Ethereum blockchain transaction to obtain a timestamp and attributability. Raw data, Analysis scripts and interpretation of a scientific experiment can be made immutable, attributable and shareable. A few months later I discovered that the AKASHA project, has been using the very same components, Ethereum and IPFS, to create a much more advanced and elaborate self-sovereign, censorship resistant “social media” publishing platform, since 2015. It is this fundamental new technology that I believe will revolutionise the entire 300+ years old approach of creating and sharing knowledge. Self-sovereign publishing will enable what Polanyi (1962) proposed when he said that “The pursuit of science by independent, self-coordinated initiatives assures the most efficient possible organisation of scientific progress”. Scientific publishers and universities have coordinated these processes for some centuries, but we are now able to hand these authorities back to the individual scientists. This does not invalidate the operational status of a university, nor of a publisher. Both will likely be able to reform themselves, but it will change the way how scientists interact with each other and the value scientists and publishers will deliver or the public can actually demand. Distributed ledger technologies helping to democratize access to science and also making science funding, communication and translation more efficient, may — like the Web —find first key applications in science and knowledge creation. To date, it is not clear which economic models currently explored may persits, many applications are only “games”. But this should not diminish their potential future impact, because “Play made the Modern World”. In the early days (2016/17) “initial coin offerings” (ICOs) as means of crowdfunding research and peer-review of scientific projects have been proposed and implemented (Bartling et al. 2017), for instance through the Mindfire Foundation or the sequencing of the Cannabis DNA. We may need to understand science funding, communication and governance in a single complex though, through which new types of very interesting organisations can be formed. Perhaps we can finally rebuild the “independent and self-coordinated initiatives” that Polanyi (1962) defined as the most efficient forms of organization for scientific progress. We may understand scientific journals as nothing else than curated lists of content. This term is well known in a field of crypto-economics that aim to embrace content curation through so called token curated registries to further reading. Based on a universal “Open Access Platform” for scientific data, outlined by Etzrodt (2019b) and also proposed by several authors in this living document, a carefully maintained list of new scientific content relevant to a particular area could easily be created. Good content creators may gain followers and thus a certain reputation. Scientific associations, laboratories etc., could all publish their own curated lists that potentially overlap and are of different stringency and depending on their origin’s trustworthiness. Given, we can obtain additional metrics on each scientific work, such as the number of times is was accessed, downloaded, cited or even better reproduced. This could allow us to create increasingly accurate lists. Subscribers of such lists could then choose to filter and compare different outlets created on a common, open data stream. 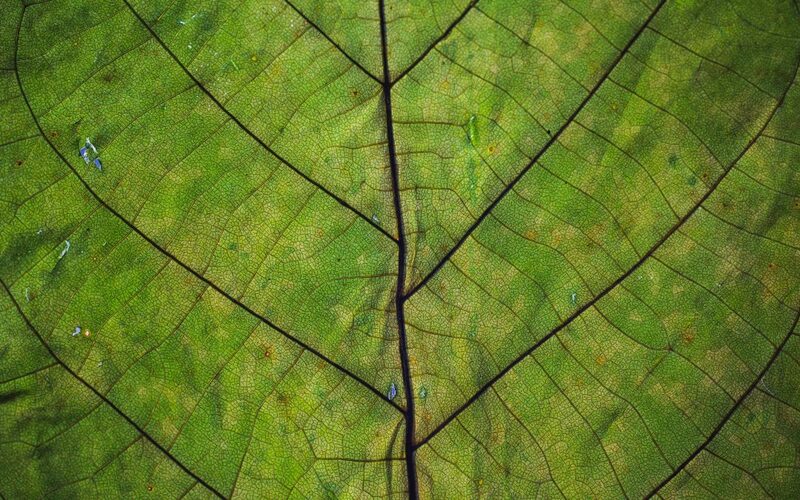 Platforms like AKASHA that provide means for self-sovereign publication may be used to add comments, insights or critical results to a growing body of truly peer-to-peer created scientific knowledge. Any addition, even a small “micro-contribution” may be valuable for the discovery process. Today, such information often gets lost and both, good ideas as well as reports on failed experiments are not communicated. While this sounds at first overwhelming, Michael Nielsen points out that even with little effort and a classical Web 2.0 approach surprising results could be obtained. One example being Timothy Gower’s Polymath blog that to this date remains to be a simple WordPress powered blog. Anyone can make a proposal for a mathematical problem in this blog and numerous have been resolved so far in a collaborative fashion. Efficient funding mechanisms, combined with a trusted communication system that allows different new means to curate content may ultimately shape entirely new forms of scientific organisations. Scientific distributed autonomous organisations (Science DAOs), proposed first by Soenke Bartling (2018) may emerge. These types of organisations will likely form around a specific scientific challenge and facilitate the coordination among scholars and the public. Private and governmental funders as well as individuals may invest in “Science DAOs” and foster the creation of great research collaborations that can scale globally. These massive research organisations may not be operated by a single hierarchical administrative layer, but through a distributed network of financial and intellectual contributors. Token curated registries, token bonding curves and token based metrics to assess reputation seem to be relevant components of such new types of scientific organisations, although much research remains to be undertaken here. The introduction of self-sovereign and collective tools for science will largely remove third parties and hand more agency as well as responsibility back to the individual researcher. Aspiring scientists do not dream of simply writing papers when they begin their career, they dream of making world-changing discoveries and for this they should be rightfully recognised. If implemented, we may now be able to create new, globally-acting research organisations that can take on long-standing global challenges. We may also find that this will create a new generation of leaders in academia that embrace collaboration instead of mindless competition. Who are truly passionate not for their next “paper”, but are contributing to broadening our knowledge by knowing how to “tame the fears of their ego” (Laloux, 2014), in sharing information and resources in a more rapid and comprehensive way that is required to accelerate the pace at which we can make progress. I would like to thank my colleague Philip Sheldrake for critical reading and helpful commenting on this manuscript. The insights presented here have been incubated during numerous discussions within the Akasha Foundation’s research team. I also thank Soenke Bartling founder of the Blockchain for Science think tank, Lambert Heller from the TIB Open Science Lab, Prof. Stefan Krauss and Gotthold Fläschner for the continuous helpful discourse on the topic. This is a crosspost from the AKASHA Foundation's Blog (https://akasha.org/blog) where an earlier version of this manuscript appeared on March 1st, 2019. Baldwin, M. (2018). Scientific Autonomy, Public Accountability, and the Rise of “Peer Review” in the Cold War United States. Isis, 109(3), 538–558. LINK. Bartling, S. (2018). 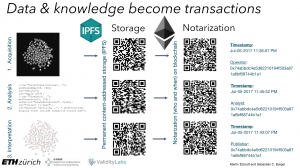 Blockchain For Open Science And Knowledge Creation – Static Version 4. Zenodo. LINK. Bartling, S., & Et Contributors To Living Document. (2017). Blockchain For Open Science And Knowledge Creation. Zenodo. LINK. Berners-Lee, T. (1990). Information Management: A Proposal. w3 archives 1990. Retrieved from LINK. Bush, V. (1945). As We May Think. The Atlantic. Retrieved from LINK. Castells, M. (2000). The rise of the network society (2nd ed). Oxford ; Malden, Mass: Blackwell Publishers. Etzrodt, M. (2018). Advancing Science Through Incentivizing Collaboration, Not Competition. Elephant in the Lab. LINK. Etzrodt, M. (2019a). Distributed organisations for Collaborative Research. Zenodo. LINK. Etzrodt, M. (2019b). Public Feedback on the Guidance on the Implementation of Plan S. Zenodo. LINK. Laloux, F. (2014). Reinventing organizations (1st ed.). Millis MA: NELSON PARKER. Leiner, B. M., G. Cerf, V., Clark, D. D., Kahn, R. E., Kleinrock, L., Lynch, D. C., … Larry G., R. (1997). Brief History of the Internet. Internet Society. Retrieved from LINK. Pangaro, P. (2011). An Economy of Insight Conversations as Transactions in the Future of Commerce. Presented at the Futurecom. Retrieved from LINK. Polani, M. (1962). The Republic of Science (Vol. 1). Minerva. Retrieved from LINK. Walter, N. (2009). The Future of Scientific Publication. Retrieved from LINK. Wasserman, L. (2012). A World Without Referees. Retrieved from LINK. Martin Etzrodt is a researcher at the Akasha Foundation. His work is focussed on creating new advanced knowledge architectures on the basis of distributed ledger technologies and the Web3.0 for the benefit of science and society.